With the cooler weather approaching I wanted to share a London based, kids knitwear brand called Knit Planet with you. Modern, colourful, unisex knitwear pieces in 100% merino wool or 100% organic cotton - including a few mums pieces! I love the graphic feel and bold colours they use in their collections - especially the electric blue, red and yellow brights. Intarsia knits are always fun for kids and I love that I can twin with them too! Violet wears Graphic Blue Jumper, inspired by children’s crayon drawings of the sky elements, the sun, the moon, the cloud and the smiling face. Its 100% organic cotton and also comes in dark grey. It's a nice thick chunky stitch and feels really soft. Gotta love a knit that has a smily face of positivity on it! Finn wears Sky Jumper Blue, he was really excited when he tried it on and said he loved the colour mixing and feel of it. It's a really nice relaxed shape with a drop shoulder and loads of room to grow so this will really last and then be handed down to Violet. I'm wearing the mums version Sky Jumper Red (it also comes in Blue) and I love the 80's retro feel and you can never go wrong with colour blocking, red and a nice long knit shape. Super comfy and works well back with skinny jeans. This is going to be part of my staple mum uniform this winter! It comes in one size but would fit a variety of shapes and sizes. If you're looking for some urban fun at the weekends with your little ones then get outside and create some adventure. Finding and collecting pretty leaves and conkers to create your own artwork and games is always popular with kids and a nice way to escape from the confines of home and the iPad! A big thank you to Knit Planet for gifting us these gorgeous Knitwear pieces. Knit Planet is currently being stocked at Olive Loves Alfie. 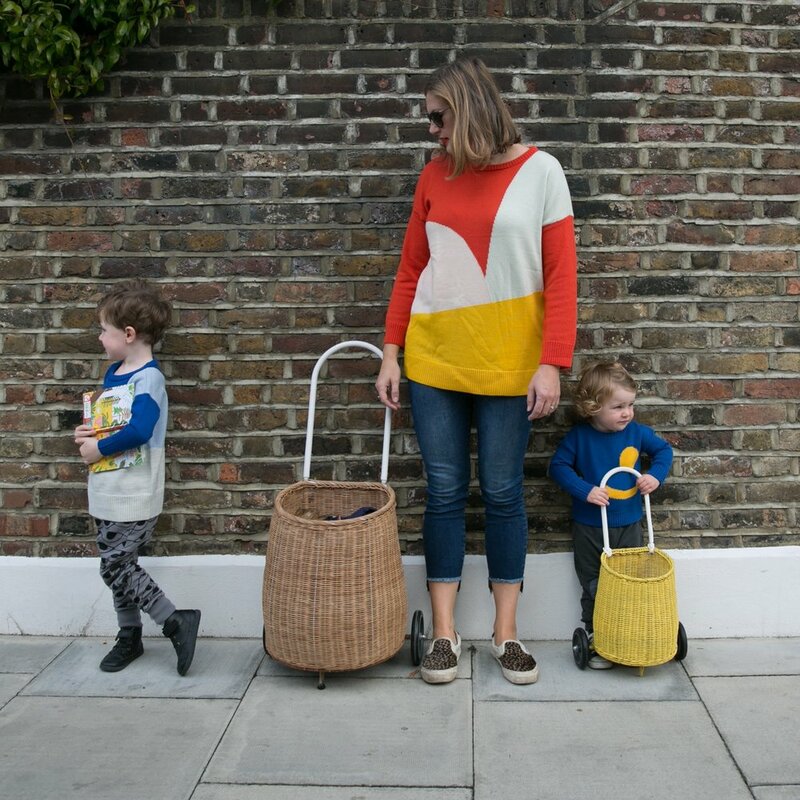 Luggy baskets used throughout by Olli Ella from Olive Loves Alfie.